Engage in communicative, interactive activities and exercises to help you learn English. Acquire confidence and skills to study further in a college or university program. Learn how to be successful within the academic culture of Canadian classrooms. Study advanced language skills in all areas, including grammar, reading, writing, listening, speaking, and pronunciation. Plan the next steps in your academic path and make your dreams come true. 2018: July 3, September 4, October 29. 2019: January 7, March 4, May 6, July 2, September 3, October 28. Ancillary fees include health and dental insurance, bus pass and access to computer labs and fitness and wellness centre membership. These fees are subject to change. For current fees by program, visit www.fanshawec.ca/fees. Deposit: CAD 100.00 non-refundable fee at the time of application. What is my starting EAP level? 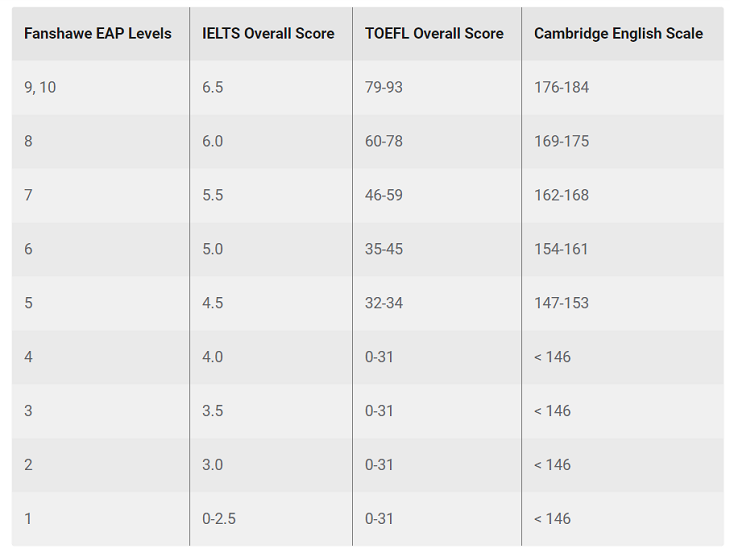 To estimate your EAP level, you can take our FREE practice test. *Alignment between test scores is subject to periodic review. Effective Jan. 1, 2017. Fanshawe College now has many degree programs. You can meet the language requirements to enter Fanshawe degree programs by completing Level 10 with 75%. We also have agreements with Western University and its affiliated university colleges – Brescia University College, Huron University College and King's University College. You do not need an IELTS or TOEFL scores to enter Western University or its affiliates as long as you have completed our EAP Program, Level 10 – Advanced Academic Preparation, with a minimum of 80%. We can assist you to obtain a "Conditional Letter of Acceptance" for any of these degree programs. To enter a Master's or Doctoral Program at Western University, the language requirement is the completion of Fanshawe College's EAP Level 10 – Advanced Academic Preparation, with a minimum of 80%. Tuition fees (these fees are subject to change).